Egypt - Where We Work - International Health - John Snow, Inc.
Egypt has been host to one of JSI's earliest, most successful projects, the Egypt National Control of Diarrheal Diseases Project, implemented from 1982-1990, which greatly reduced infant death due to diarrhea. The project was touted by the British Medical Journal as "the world's most successful health programme." The NCDD Project successfully trained more than 40,000 physicians, nurses, pharmacists, and government officials in oral rehydration therapy (ORT). It set up 6,000 ORT room corners in health facilities; established 30 rehydration training centers; and developed customized ORS packaging following extensive market research. The NCDD Project was instrumental in Egypt, establishing marketing and distribution networks for packaged ORS that were specially designed to meet Egypt's socio-cultural needs. JSI has remained committed to improving Egypt's health outcomes through initiatives such as the Healthy Mother/Healthy Child program (HM/HC 1998-2005), which established an essential package of maternal, neonatal, and child health standards. 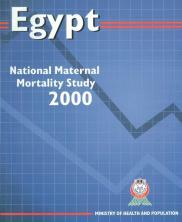 HM/HC contributed to reducing the national maternal mortality rate by over 50% and was directly responsible for reducing maternal deaths by over 60% in Upper Egypt. Studies have shown that through the HM/HC project approach, the Egyptian Ministry of Health and Population improved access to and quality of maternal and reproductive health services, reduced fertility rates, and increased antenatal care use and skilled attendance at delivery. JSI also worked to improve the quality of services in primary health care units, focused on monitoring and strengthening health logistics systems. 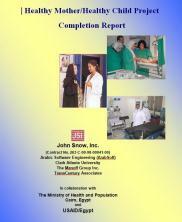 In 2011, JSI completed work on the Egypt Takamol project (managed by Pathfinder Inc.) in which JSI increased use and improved the quality of integrated MCH/FP/RH services in hospitals in Upper and Lower Egypt. One significant accomplishment is that admissions to the neonatal intensive care units in hospitals increased 40% over the life of the project. 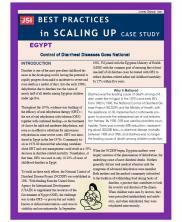 Currently, JSI implements the USAID-funded Strengthening Egypt's Family Planning Program (SEFPP) activity. In partnership with the Egyptian Ministry of Health and Population and National Population Council, SEFPP is working to reduce the unmet need of women and men for family planning services, including counseling and method mix, through evidence-based planning, decision making, and policy formulation. Takamol assisted the Egyptian government to improve health outcomes for newborns, mothers & families by strengthening community mobilization as well as the capacity of health facility managers & ministry officials to sustain quality of care improvements.